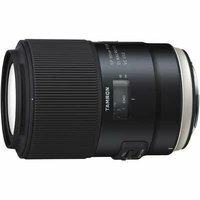 The Tamron 90mm f2.8 SP Di USD VC 1:1 Macro lens is a short telephoto prime designed for full-frame DSLRs and optimised for close-up shooting. The lens offers a life-size magnification ratio of 1:1 and inherits many of the standout features that made its predecessor so popular, in addition to a couple of new enhancements to improve overall performance. XY-Shift compensation has been newly added to reinforce VC functionality, further improving image stabilisation capabilities at any shooting distance from infinity to macro. Also, the near-silent USD (Ultra Silent Drive) motor has been fine-tuned for faster, more precise and quieter autofocusing, and it also supports full-time manual override.